Supports mining all Equihash <144,5> (Zhash), <192,7> and <96,5> cryptocurrencies. Requires minimum 2GB GPU’s. Ex. GTX 1050 2GB. miniZ works on Linux and Windows. 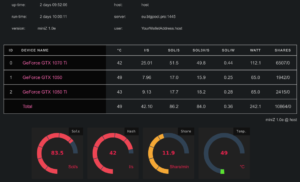 Cool console output and telemetry monitoring. Developer fee is set to 2%. For a detailed description of features read here. To start running miniZ go to the Download page here. Next, you can read the Usage and FAQ pages, for instructions and examples. On miniZ Blog page you can find all the announcements on new optimized versions/releases. Furthermore, miniZ team will always strive to give you support and feedback. Please check the Support page, for more information.